Established during 2008, Road Traffic Management Services Limited offers professional temporary traffic management solutions to roadworks contractors, local authorities or indeed anyone involved with the disruption of the normal flow of traffic on public roads today. We provide a range of traffic management services to our customers from surveying, right through to designing, installing, maintaining and removing temporary traffic management schemes on their behalf. As part of our service we can also arrange the supply of traffic management equipment such as Vehicle Activated Traffic Lights, Variable Message Signs, Traffic Cones etc. together with trained personnel. 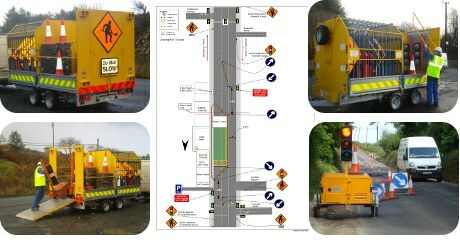 Since the 1st April 2009 traffic management services is becoming more popular throughout Ireland with the compliance deadline for Chapter 8 taking effect since then. Regardless of where your works are taking place we can provide traffic management on your behalf ranging from just preparing the traffic management plans right through to providing the traffic management services on a fixed price contract basis. For the Erection & Dismantling of Tower Cranes on Construction Sites Traffic Management is now also becoming necessary on most projects as these works usually involve some works on the public road. We can manage all of this on your behalf including acquring the permit from your local authority together with the preperation of detailed drawings, right through to providing trained personnel on site all day while the erection or dismantling is taking place to assist delivery trucks on/off site etc.